The coolest dude among all animals, and then some. Tamandua (Tamandua tetradactyla) is a smaller species of anteaters, but some would say they are the "perfect" anteaters - just the right size, and just the right amount of attitude. They are most closely related to sloths and armadillos, but seeing these pictures will make you wonder if you aren't related to them by any chance. It seems they know how special they look, and don't mind posing in sweaters and other handmade clothes. 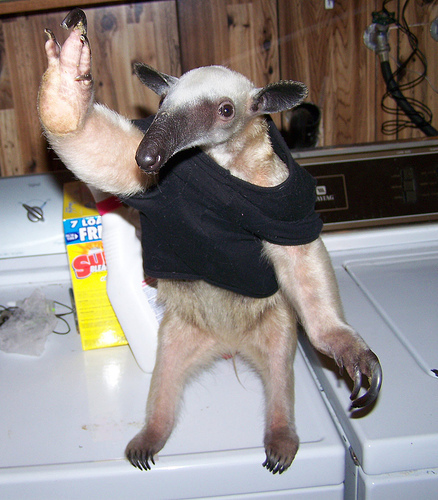 TamanduaGirl (see Anteater Entertainment) keeps two South American anteaters - tamanduas Pua and Stewie - in her house. See the photo chronicle of their life in this set and videos on this page. The owner says: "Tamanduas are very smart. They know how to open the fridge, open the doors..."
"...they know how to open the window, open drawers, open cabinets, open containers, climb the door frame, and respond to their name." "The dogs are scared of their long tails; and some tamanduas may use their long claws on almost anything, including your furniture. They like to tear things up when given the chance like coconuts and logs". 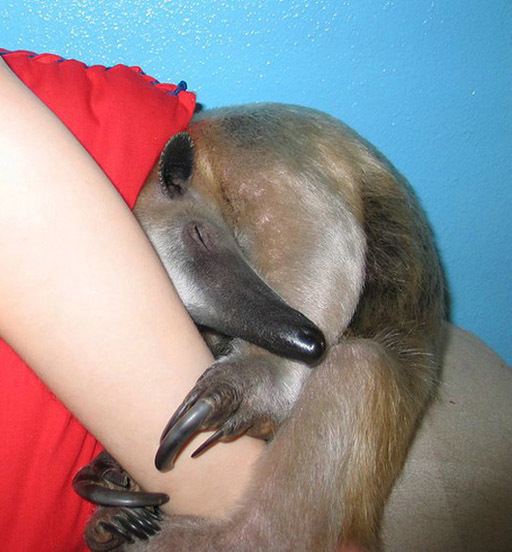 Do your homework and be prepared to put with many surprises, if you consider an anteater as a pet. First of all, they don't come cheap (up to $4,500) - and they need a special diet (unless you have an endless supply of ants, but even then, they need a supplement) Tamanduas are very loving, but just like cats, they tend to "let you" love them. Make sure to check out the frequently-updated blog, documenting the owners' eventful life with TWO anteaters in the house. They're cute, but at the same time, a little creepy, lol. Sooo cute...although the one on the leash is a bit much. But then again, saying "a bit much" in the context of a wild animal in a denim jacked isn't exactly relevant. I honestly don't know whether to laugh hysterically or cry - the idea of someone not only buying exotic wild animals that were either snatched from their native forest or worse, bred in captivity... but then dressing them up in dolls clothes and using them as fame fodder?! This isn't cute at all, it's insane. People like that should not be allowed to keep any sort of animals, let alone wild animals. When will people ever learn that animals are not play things to be kept for our twisted amusement? Oh yes, Rox, because animals are so intelligent, right? Get real - in the wild, they'd almost definitely have a much, much, much shorter life, a harder time and would be more at risk of disease or predators. Animals are not intelligent enough to comprehend things like "natural habitats" or "freedom". Animals merely want 3 things - food, water and safety. In that home, that is provided for them. They aren't suffering, and its silly to the extreme to believe that they possess the same awareness or emotions as human beings, given that they are a different species than us. Animals are happy as long as you provide them with basic needs - they don't have philosophies, or ideals or dreams. Their brains aren't complex enough for that. These animals are being well taken care of. Part of the problem with you is that you assume that animals are like us. They are NOTHING like us. They do have a right to be kept free from pain and such, but they are in no emotion or physical pain in that household. They don't have the brains to even comprehend such things like "captivity" or "freedom". If you re-read my comment, I didn't say anything about animals being on the same level as humans. But the logic in thinking that wild animals are better off being put to work on movies, and being used for shows of 300 or more children and being dressed in dolls clothes and kept in cages and allowed to roam a house rather than being in their natural habitat is warped. As for animals in captivity having longer healthier lives, that actually isn't always the case. Even with these anteaters, the female is sick and may soon be retired from 'show business'. Not getting the proper diet they would have in the wild and having supplements instead isn't always conducive to a long life. And if it's silly to think that they deserve a natural existence, then fine, maybe I am silly. But the exotic pet trade still plays a big part in poaching and illegal animal trade, and when you stop to wonder how these animals are caught, it doesn't seem so silly. Just because they don't have the same superior intelligence and reasoning we have, it doesn't give us the right to exploit them. Brainpicker claims breeding them in captivity is worse than taking them from the wild. Well how are they going to miss something they never knew? How is it worse? Captive private breeding has saved many species on the brink of extinction. American bison, springbok, both of which were reintroduced from captive private bred stock. And there are many others such as lemurs, fennec fox, some chameleons, and some breeds of cockatoos and numerous species I can't think of that are threatened or even extinct in the wild that are in large numbers in the pet trade. This is GOOD. The species survival is assured as long as people want them. The clothes are so it stays warm and not really any different from the harness it wears to go out. If it doesn't mind, and it doesn't seem to, then there's no harm in the clothing also being cute. Animals are almost always longer lived in captivity when well treated, there are rare exceptions. The female having got sick is old news and was some bacterial infection. She was said to be considering retirement because Pua didn't like doing it as much as the male. All the full info is in the blogs. The legal pet trade plays no part in poaching. The vast majority of exotic pets are bred in captivity for many generations this only helps the wild populations through better awareness and no reason to take any from the wild with a captive supply, which could be relied on when reintroduction becomes needed. There are not enough zoos to handle all the animals that are threatened. For the few taken from the wild trade is highly regulated and limited under C.I.T.E.S. The illegal animal trade you speak of is over 90% animal parts for medicines, food, or trophies. The few pets produced from it are a by product of the other(killed mom for meat, hey lets try to sell the baby). And again the captive animals especially the well loved pets help foster a love for the wild animals. Just look at the love for these cute animals many have never even heard of before. I can see your logic, and what you are trying to say - but at the end of the day, buying exotic wild animals creates a demand. This in turn gives poachers and animal traders more incentive to capture wild animals as well as breed them and the more demand there is, the more likelihood of poorer breeding conditions and bigger 'farms'. The irony is that it is people and their need to use animals for profit who are the biggest factor in the threat of species endangerment - capturing or breeding the species only perpetuates this problem, and is far from 'conservation' as circus animals are. Breeding and selling wild animals to people who want a novelty pet is about profit and not about preservation of species. No matter how I look at it, I just don't see the exotic pet trade as a good thing. Anteater Coolness? Oh yeah. Just about as cool as wearing real fur and eating shark fin soup. 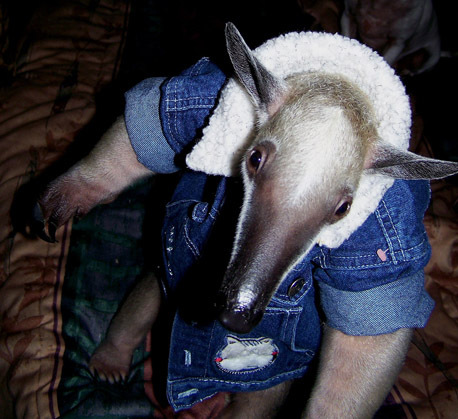 Now, anteaters with a fancy price tag in doll's clothes, how insane can it get? No, it's not cool, it's just totally lame. And the justification for doing so is equally lame. Here again we have people with too much money and too much time on their hands. It's always like that. I could SO sic these cute guys on the fire ant mounds here. Even if they couldn't wipe out the ants, it would be a delight to get them to off the little critters. If you read the info page @ the tamandua owner's site, at least one of them was found in the wild VERY ILL and the owner rescued him and nursed him back to health. I don't see anything wrong with that. How do you know these animals weren't saved or even just found and kept as a pet, they seem happy and cute, I didn't see any pictures of the ant eaters getting tortured so its all good. These animals look like there well taken care of. rox, go read 'Life of Pi', then think again. They'd be lovely in a stew. >> "natural habitats" or "freedom". >> philosophies, or ideals or dreams. Please explain how you have done something that no scientist has ever managed - reading animals' minds? We've actually nominated a foul-mouthed Anteater for president this year! He's running as an independent Anteater. It's good to see his constituents enjoying life in this country. First of all "Occams Razor" - If you've ever owned a pet in your life you would know that animals do have souls and can think for themselves. I'm not saying they have human intelligence or all our emotions, but they do feel, animals can suffer from emotions like depression, just like people do. Yes, animals in the wild have shorter life spans and are predated upon, but that is natural, taking an animal out of their natural habitat is NOT! And second, I understand people’s desire to help endangered species, but how are you helping them by keeping them in your home and turning them into pets? Preserving species is a job for the zoos, who can keep these animals in a close to natural habitat, as appose to your house. I am currently a senior at Delaware Valley College majoring in Conservation and Wildlife Management, so exotic and endangered animals are my study. People, these are NOT PETS, nor should they ever be pets, and they are NOT domesticated! Putting an animal in your house and training it does not make it a domestic animal. If you're that adamant on helping to save an endangered species then donate money to a cause. Keeping a wild animal as a pet does nothing to help preserve the species. And by purchasing one you are only helping to aid the exotic animal trade, which means your money is going toward taking even more critically endangered animals - like tigers - out of their natural habitats to live out a horrible life as someone’s pet. The exotic animal trade/market is ranked just below the illegal drug trade and just above the illegal gun trade. Most of these animals are ripped from their mothers as babies and shipped all over the world to be kept as pets, how on earth can that possibly help that animal. Yes they are adorable and would be awesome to own, but if you really want to touch wild animals then get a job at a zoo and do something practical to help a species. the only way to truly preserve an animal is by making sure you can release them back into the wild. these so called "pets" can never be released back into the wild because people like this have taken their natural survival skills away by raising them in households. Its the same for people who breed them for pets. Yes Captive private breeding has saved many species on the brink of extinction, but they weren't bred by normal people, they were bred and supervised by trained wildlife professionals, and had minimal contact with people. I think they're great! They seem very happy in the human habitat, with clothes on or not so who cares where they came from! At least they're not some predator food. First off, no species of Tamandua is endangered. They're listed as Least Concern and there's tons of them. Saying anything about keeping endangered species as pets is just not applicable here. Secondly, there's nothing wrong with captive breeding pet animals. You're not removing them from their environment, and any imaginary concept of "freedom" you think these animals have would also be shared by your cat and your dog and your goldfish. the same arguments against keeping these animals as pets listed in this comments board could be applied to more traditionally domesticated animals. why don't you do the world a favor and educate yourselves a little bit better. No matter what you think, you are inadvertently supporting the wildlife trade every time you buy one of these, or other, wild animals as pets. it doesn’t matter if they were bred in the US or not your money will eventually wind up funding the trade...you bought it from a breeder in America, who obtained theirs from someone else in America, who obtained theirs from someone in Canada, who obtained theirs from someone in germany, who while on vacation bought theirs from a seller at a market in South America who trapped the animal ripped it from its natural habitat and decided to sell it make some money off of it…that’s how it works people. Your purchase creates a demand and your money eventually goes back to that seller, who in turn traps and sells more and more of these already endangered creatures. Because once many generations back one of your exotic pet's ancestors was wild no one should ever own any and all in captivity should never be bred and let die out? With that kind of thinking no one should ever own dogs, cats or bunnies either, their ancestors were once wild too. Many species accepted as domestic do not go back that far to the wild like hamsters, around 70 years since first discovered and captured for captivity. Also the idea no one should do something that is legal just because someone somewhere might do something similar that is illegal would prevent almost everything anyone does. I shouldn't build my house with all permits in place because someone might try to build one without permits(illegally), for example. Surely you see how silly that thinking is. If all laws were followed and the animal is healthy and reasonably happy then it's none of your business how someone choose to live their life, be it with an exotic, in a tree house or with a gay lover. It's a personal choice where no one not even the animal gets hurt. Sure someone MIGHT abuse one but so might domestic pet owners and people with children yet no one is saying no one should have them because others might abuse theirs. Go pick on something more alarming than loving a pet. That is really cute and I would love to have one, minus the smell of course. But I also love parrots, yet do not buy one because I do not want to support the wildlife trade. I also believe that it is unethical to breed them solely for the existence of human enjoyment. Even a bird from a shelter would be a problem because I would feel bad about keeping them in cages in general. The same goes for anteaters like Kua. She is a wild animal and belongs in the Amazon, not a suburban home near Chicago On a positive note however, I would not have to pay much money to feed her. I made the mistake of planting five peony plants near my front door two years ago and now from April to October we are INFESTED with giant ants, which is why I want to get an anteater in the first place. So, what type of sauce do you serve with these things. Occams Razor, I can't believe your ignorance. Rox you are right. Unless some of these are rescued animals. What do they eat besides ants? People buy exotic pets because it makes them the center of attention. To say an exotic pet is better off in the home is just rationalizing bad behavior on the part of the human. I don't like people who keep exotic pets. They have a personality disorder that I do not care for. Why don't you visit the animal shelter and get cat or dog? Oh, that would not garner the attention you so despartely need, would it?